Talk Like A Pirate Day be upon us again me hearties! 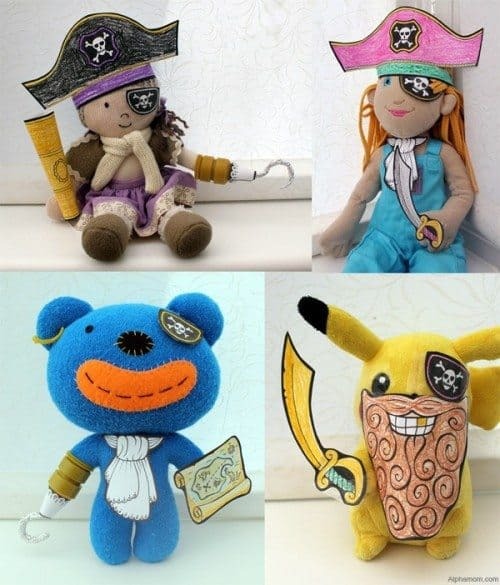 This year we have a quick and easy little black and white printable that you can color, cut, and stick with tape to your soft toys, turning them from teddies and dollies into a pack of scurvy sea dogs for hours of piratey play. 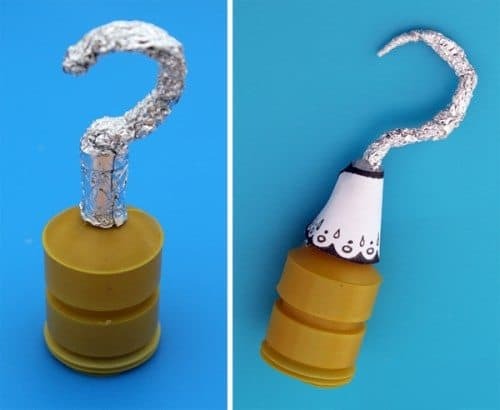 Plus, make your toys a pirate hook with just a party popper and some tin foil! Click here for your Talk Like a Pirate Day free printable: in regular letter sized paper and in A4 sized paper. 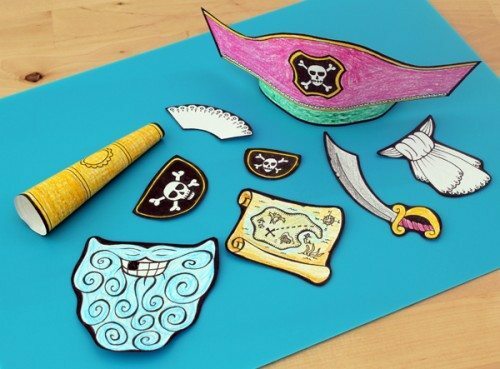 These pirate dress-up pieces are drawn in black and white so that kids can have fun coloring them the way they want, and even make opposing pirate gangs to swashbuckle. 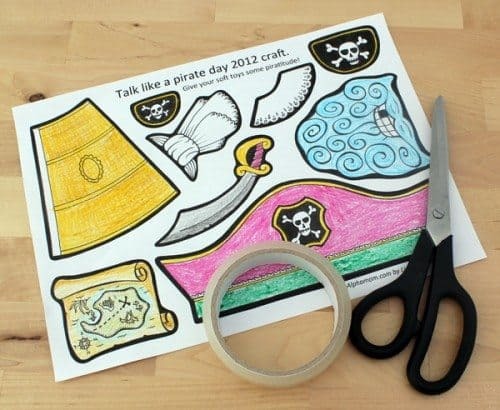 The extra thick and simple black outlines should make it easier for children to cut these out themselves too. 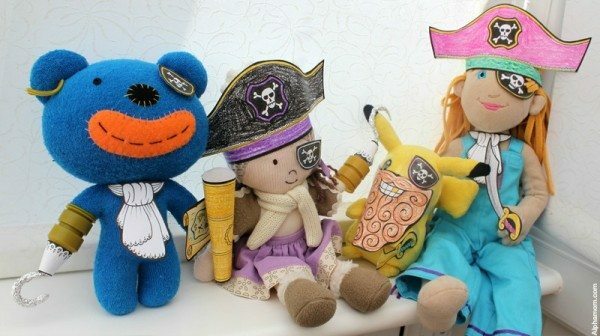 The kit contains pirate hat, necktie, treasure map, cutlass, telescope, two different sized eye patches, stick-on beard, and a frilly cuff to put on your hook if you choose to make one. You can use either regular tape or double sided tape to stick these onto your toys and they should come off easily leaving no damage when you are done playing. 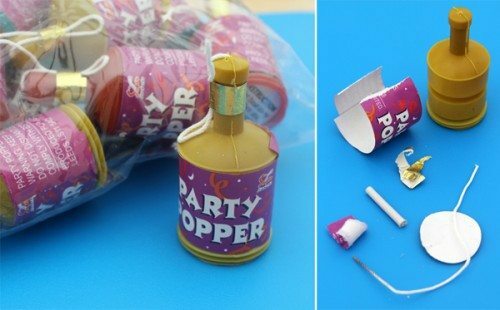 All you need to make your toys a pirate hook are a few used party poppers (which by the way are excellent for making pirate cannon sound effects!) Just take all the paper bits off your used party popper, leaving the plastic case. 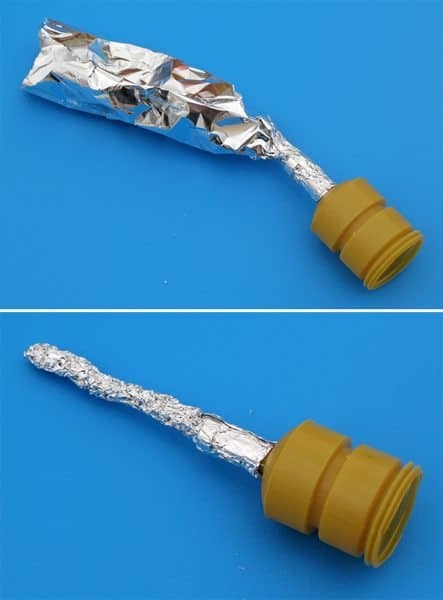 Then take a little bit of tin foil and roll it around the neck of the party popper. Once it is firmly squished on, scrunch the rest of the foil into a solid pole. Bend it into a hook shape and glue on the little lace cuff from the printable. 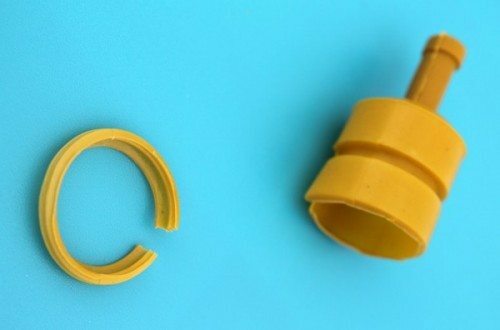 These will fit over your toy’s hands and can be taken off and put back on again easily without damaging toys. If you have extra party poppers, then you can cut off the bottom of the popper tube to make a clip on pirate hoop earring too. At our house the Dread Pirate Polly Dolly and her buccaneers sail the bedroom floor making all the other toys tremble in fear. Blue Bear reads the maps, while Golden-Toothed Pikachu quite frankly freaks everyone the heck out. I mean just look at him! Happy Talk Like A Pirate Day, everyone! Landlubber scum beware! Love the printable beard! My daughter is always making accessories for her dolls so this will be perfect for her.